Congratulations to the 2018 RMWQAA Analyst of the Year…. Zach Dahlgren finished up his 5th year with the City of Greeley at the Greeley Water Pollution Control Facility (WPCF), and in doing so he put together an outstanding resume of going above and beyond his expected duties to help aid others in the plant and across the Front Range with various social and laboratory based responsibilities. On top of his main tasks of performing lab analyses (occasionally on weekends and holidays), maintaining QA/QC programs, and ensuring quality performance throughout the lab, Zach still found time to be a highly valuable asset to nearly every other aspect of the plant. In the years since he began, the WPCF has gone through a change in databases that was largely headed by Zach himself in the form of transforming Excel bench sheets into Water Information Management System (WIMS), programming the software to generate reports, and transferring data from past years into this new system. This program fully replaced Excel as WPCF’s go-to source for information and reporting at the beginning of 2017, and with Zach’s help it consistently improved to become a more streamlined system for everyone across the plant. He managed all this while also training the new water quality analyst in both the new program and the lab itself. Zach also dedicated his time to being the on-site IT point of contact to aid in everything from troubleshooting regulatory account logins to installing and keeping software up to date. 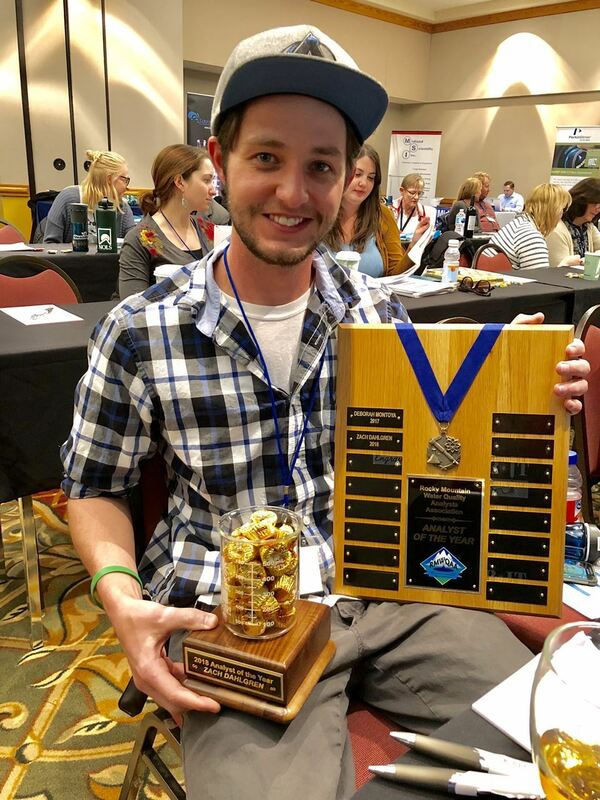 Zach created a program to collect river temperature data across segments of the Poudre River upstream and downstream of the plant in an effort to ensure temperature discharge goals are met. He was regularly in contact with Operations to help with various probe calibrations across the plant, and seemingly anything else they might need a hand with or second opinion on. Zach partnered with an outside energy provider in an effort to predict expected energy usage and find ways to use less energy. More than 80 hours of work had been put towards this project throughout 2018, and in doing so the energy costs have seen a solid reduction based on past years performance. The templates for these reports were also sent out to other labs and have aided in helping them create their own Energy Information System. Add to this Zach's willingness to help gather data and create reports and equations to help engineering consultants with the new Greeley Master Plan, and you can see Zach did far more than his job title of Water Quality Analyst may imply. Outside of the plant, Zach consistently played a major role in the RMWQAA website as an administrator and tech support guru. In 2018, he implemented a way for groups to sign up multiple members in an effort to streamline the yearly renewal process for larger labs. Zach has recently moved across the country and the Greeley WPCF and the RMWQAA greatly miss him. Good luck to Zach and all his future endeavors and congratulations to Zach on winning the 2018 RMWQAA analyst of the year.